Many jobs expose workers to toxic chemicals and substances. These jobs may be at factories, construction sites, or even offices. Most employees assume that their employer will take steps to provide adequate ventilation and safety gear, such as necessary masks. However, this is not always the case. If you develop an illness due to inadequate ventilation on the job, the experienced Boston workers’ compensation attorneys at Pulgini & Norton may be able to help you recover benefits. Ventilation is of tremendous importance to industrial hygienists for improving the quality of air on the job. It involves controlling the airflow of the environment. There are specific standards that cover the construction industry, long shoring, shipyard employment, and the general industry. Ventilation may be poor in facilities that do not have adequate maintenance of ventilation equipment, facilities without windows or with high occupancy, and facilities operating to maximize energy conservation. Employers in Massachusetts have a responsibility to their employees to make sure that spaces are well ventilated and that the employee has training and access to the right protective equipment for a particular work environment. Toxic chemicals and substances that may injure an employee include benzene, acid, paint, solvent, silica, pesticide, cadmium, and lead. In some cases, employees may encounter toxic chemicals from skin contact, but most often, it is through breathing fumes of these chemicals. The most common injuries from breathing toxic chemicals are throat injuries, lung injuries, and rashes. Neurological or nerve damage is also a possibility. Some toxic chemicals may cause brain damage when a worker is exposed to them without adequate ventilation. If you are injured on the job due to toxic exposure because of inadequate ventilation, you may be able to recover workers' compensation benefits. You should report your exposure to your employer and seek medical attention promptly. In order to be eligible for workers' compensation benefits, you must be out of work for at least five days, and you are paid beginning on the sixth day unless you are unable to work for more than 21 days. Your employer's insurer will investigate your claim. Even if you start to receive benefits soon after reporting the matter to your employer, you should not assume that the insurer has accepted liability. Quite often, insurers utilize what is known as a pay-without-prejudice period, which is the first 180 days after your initial injury. You may be paid benefits for up to 180 days before the insurer makes a final decision about your claim. 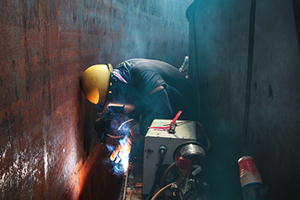 Sometimes toxic exposures are acute and result from a specific accident on the job. However, they may also be cumulative, causing harm only after months or years of inadequate ventilation. Although workers' compensation laws were designed to make it easier to recover benefits, in practice, it may be hard to establish certain types of claims. Toxic exposure may be especially difficult to prove when it is cumulative rather than acute. If you believe that your illness or injury was a result of inadequate ventilation on the job, the Boston workers’ compensation lawyers at Pulgini & Norton may be able to advise and represent you. We handle claims throughout Massachusetts, including in Hyde Park, New Bedford, and Lowell. For a free consultation with a job injury lawyer, contact us online or call us at 781-843-2200.